Israeli PM meets with New Zealand defense minister, says time has come 'for all decent countries to combat anti-Zionism'. 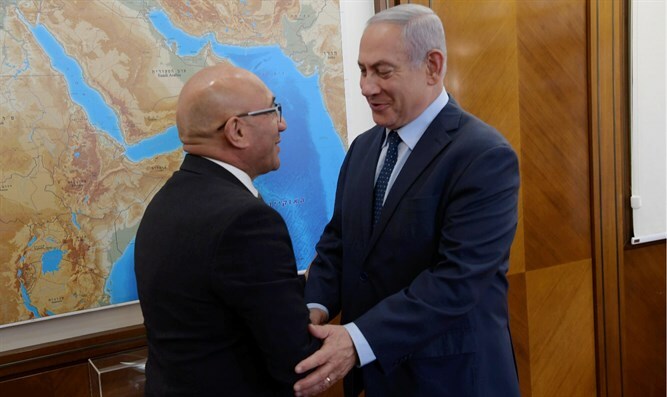 Israeli Prime Minister Binyamin Netanyahu met with New Zealand’s defense minister, Ron Mark, Sunday night in Jerusalem. The Israeli leader celebrated his country’s “very friendly relations” with New Zealand, while expressing hope for “even friendlier” ties. "We have very friendly relations with New Zealand. We’d like to make them even friendlier on all matters – economy, security and diplomacy." Netanyahu also commented on the rise in anti-Semitism globally, linking it with the rise in anti-Israel and anti-Zionist sentiments and urging “all decent countries” to combat the spread of anti-Zionism. “The main attack against the Jewish people today is the attacks against the Jewish state and the attempt to delegitimize the very right of the Jewish people for a state of their own. This is called anti-Zionism. So the new form of anti-Semitism is anti-Zionism, and we ask not only all our friends, but all decent countries everywhere to include anti-Semitism, the definition of anti-Semitism, anti-Zionism as well. And so I’ve just made that request from you as well." Defense Minister Ron Mark said New Zealand was committed to supporting peace in the region “through the United Nations”, noting his country’s involvement over the past six decades. "I think you know from our commitment going back as far as 1954, New Zealand has been here, playing a role, helping to contribute to peace and stability and that’s through the United Nations, and then again in 1982 with the MFO, and we’re still here so long as you want."